Nazneen Aziz is the Executive Director of the Kaiser Permanente Research Bank (KPRB). In this role, Dr. Aziz will be responsible for strategic direction and operations of KPRB. 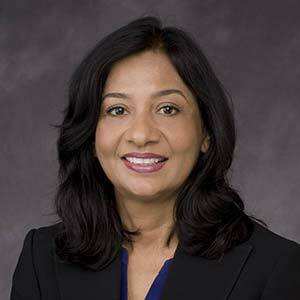 her previous roles, Dr. Aziz was the SVP and Chief Research Officer at Phoenix Children’s Hospital, Director of Molecular Medicine at the College of American Pathologists (CAP). During her tenure at CAP, she led the development of the first set of standards and proficiency tests for clinical laboratories using next-generation sequencing. Dr. Aziz held executive leadership positions in the biotech/biopharma industry where she focused on personalized medicine, genetic tests, and development of drugs for cancer and diabetes. In her academic career, Dr. Aziz was an Assistant Professor at Harvard Medical School and Boston Children’s Hospital. Dr. Aziz received her Ph.D (molecular genetics) and MS (biochemistry) at MIT. Her publications have been cited extensively in the medical and scientific literature and she has been invited to speak at numerous national and international conferences. The talk will focus on the vital role biobanks have in precision medicine. Dr. Aziz will describe infrastructure development for biobanks. She will also discuss approaches used by health institutions to facilitate innovative research to improve health and healthcare. Session Synopsis: Biobanking is crucial to biomedicine. Biobanks are changing the face of medical research by making available a wealth of material needed for broad research, to investigate cancerous tissues, allow access to healthy controls, and more. This session, featuring leaders from two large biobanks and explores the importance of biobanking for personalized medicine, touching on infrastructure requirements, data access policy, and other primary concerns associated with the management of biobanks.